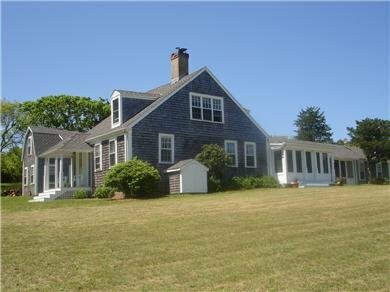 Built over 100 years ago, this beautiful colonial home has been remodelled to provide all the amenities for contemporary vacation living while retaining its original island charm. Two separate bedroom wings help create an air of spaciousness while a generous kitchen and dining area offer the perfect gathering spot for large families. Gracefully poised on 5 exclusive acres and abutted by an additional 30+undeveloped acres, the property boasts 625 feet of private beach on Katama Bay with boating access to Edgartown Harbor and Chappaquiddick's southern shore. Within walking distance from the house, the beach is ideal for swimming, windsurfing, sailing, kayaking, fishing, and long walks. With its tranquil location and close proximity to two of Martha's Vineyard's finest beaches for surf-East Beach and Wasque Reservation - each under 2 miles away - Maqua Downs offers ample outdoor space and plenty of room to be the perfect home for a family vacation or reuion. We are privileged to offer to a very special family to enjoy a secluded, undisturbed Summer on Martha's Vineyard. This inviting and well equipped home was decorated with an artist's keen eye for balance, beauty and function. You will love the flow, and the space, where each guest can find a place to retreat or to come together. The kitchen has a lareg dining table, as well as counter for all to sit together for a meal. A screened sunroom can be opened from the kitchen. The living room is lovely and spacious, and there are too many bedrooms and baths to describe, but our photos tell the story.